The fermentation process is a very traditional method which is used in many different cultures around the world. When a food is fermented it becomes a rich source of beneficial bacteria, which is needed for good digestion as well as many other processes in the body. A lot of the ingredients in fermented foods are uncooked, so they are full of life force and have retained all their vitamins and enzymes, which are highly beneficial for our health. Fermented foods help the body to assimilate more nutrients like vitamins B, D and K, and they also help to detoxify the body by expelling toxins. Some of them help to reduce inflammation as well. There are many health benefits to be gained simply by eating fermented foods. The beneficial bacteria found in fermented foods helps to restore the levels of good bacteria in our digestive systems. Healthy gut flora is linked to a strong immune system as well as good digestion. Increased levels of good bacteria can also help with regenerating the body’s cells, oxygenating the blood, cleaning out toxins to help eliminate acid, reducing cholesterol and activating the metabolism. The consumption of fermented foods can help with a broad range of health conditions from IBS to autoimmune diseases, chronic fatigue and candida. For individuals who have digestive issues like IBS it would be worth having a consultation with a naturopath to find out the best types of fermented foods to help your condition. Examples of fermented foods that can be bought from your local health food store include sauerkraut and kimchi, which are both forms of fermented cabbage. Then there is kefir, which is a fermented milk drink made from kefir grains. It is similar in consistency to yogurt. Pasteurised miso is another great fermented food made from soya which is often used in Japanese cooking. Kombucha is a type of fermented tea which is available fresh from the bottle. Sourdough bread is another great fermented product, as is apple cider vinegar with the mother – the mother is the bacteria which helps with the fermentation process. You can use it in salads, sauces and dressings – it’s a very versatile product. If you would like to incorporate more fermented foods in your diet then I would recommend eating a wide range of different types as each one contains a different strain of bacteria. By varying the types of fermented foods you are eating this will have a broader effect on your health. My advice would be to start with one tablespoon a day of your chosen foods and increase this amount to between three tablespoons and half a cup a day. At first you may experience some uncomfortable symptoms, such as bloating, but this is normal because you are expelling the toxins from your body. Fermented foods can really help to enhance our health and wellbeing and your local health food store is a great place to find out more about them. Aurélie offers naturopathic consultations at the two Natural Health stores in Hertford and Welwyn. Both stores stock a wide range of natural, healthy and organic foods ranging from nuts, seeds and honey to special dietary foods such as paleo, gluten and dairy-free produce. Supplement brands such as Solgar, A. Vogel, Viridian, Nature’s Plus and many more are available too. A wide range of natural and organic bodycare products are available in both stores, which are manned by highly trained staff who are always on hand to answer your questions. There are therapy centres at both locations, which offer a wide range of complementary therapies from aromatherapy and acupuncture to reiki and reflexology. To find out more about the Natural Store, visit www.naturalhealthwelwyn.co.uk or call 01707 392 020 for the Welwyn store and 01992 550 101 for the Hertford store. 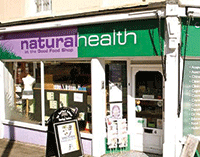 Follow them on Twitter at @_NaturalHealth_ and /NaturalHealthStoreUK for Facebook.